Tasmania's parched east coast has received a much-needed drenching, while summer snow fell in the central highlands overnight. 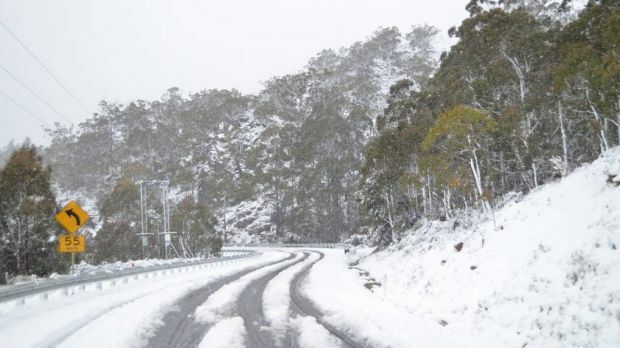 The Bureau of Meteorology received reports of up to 40 centimetres of snow in the central highlands, about a week after a spring heatwave shattered records in many parts of Tasmania. About 3000 properties across the state are without power on Sunday morning as a weather system that brought record rain to Victoria sweeps across the Apple Isle. Several towns got more than 50mm, including St Helens, Bicheno and Swansea, in the 24 hours to 9am on Sunday. A severe weather warning remains in place for the state's east coast from St Helens to south of Hobart. Damaging wind gusts close to 100km/h and heavy rains are likely but conditions are expected to ease by Sunday evening. The SES is trying to patch up a handful of homes in Greater Hobart. "It's mostly water into houses and damaged roofs. We've been sandbagging a few properties," southern regional manager Mark Nelson said. A minor flood warning has been issued for several waterways, including the River Derwent. The worst of Victoria's deluge is "well and truly over", the Bureau of Metereology says. There will be some showers continuing into Monday for most of the state but heavy rainfall has abated, bureau forecaster Dean Stewart said. "In most areas the worst is well and truly over," he said. "Generally the rain will have stopped in most areas and the flash flooding is subsiding across the state." However while most of Victoria will be drying out, East Gippsland may get 100 milimetres mid-week. The storm front hit the state on Friday, with the north-east the worst affected as Euroa, Myrtleford and the Buckland Valley faced severe flooding. Emergency Commissioner Craig Lapsley says people need to remain vigilant because large amounts of water are still moving down rivers. "The water will move through and that will take, in some cases, hours or days to do so," he said. "The message to the Victorian community, particularly in north-east Victoria or Gippsland, is stay tuned about your river system and what it will do in your backyard." A number of moderate flood warnings remain in place, including for the Yarra, Ovens and King rivers. 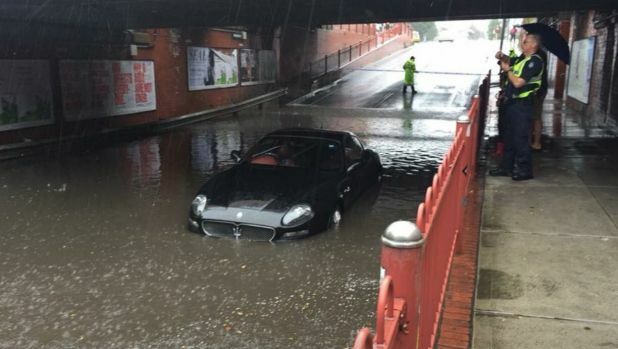 Melbourne was hit by its heaviest day of December rainfall in 25 years as more than 43 millimetres of rain fell on the city on Saturday and Sunday morning. The city recorded more than 66 millimetres between Friday and Sunday, beating its December average in the first three days of the month. But a Country Fire Authority captain in the state's north-east believes warnings of an "unprecedented weather event" wherein "farms would turn into lakes" were over-the-top. Myrtleford CFA captain Gary Gunson said the warnings were extreme considering what took place. "It was very flat, it wasn't what was expected, but we were prepared and that's important," Mr Gunson said. "We need warnings but maybe not to the extremities they did go." On Sunday, Daniel Andrews was forced to defend emergency warnings as he visited what was meant to be the flood's worst areas Myrtleford and Wangaratta – greeting CFA and SES volunteers by exclaiming it was "drier than expected". Mr Andrews said the Bureau of Meteorology correctly predicted the amount of rain, but indicated he might have phrased warnings differently than the bureau. "We can look back on whether some comments were words I would have used but ultimately the bureau and emergency services, myself included, we've been very clear with the Victorian community," he said. "The total of rainfall was absolutely accurate – the intensity of it was different and the exact location if it was a bit different, that's something we all should be happy about." State weather bureau manager Dr Andrew Tupper also defended the language and warnings saying the storms were "pretty much as we described". Mr Andrews said he was certain Victorians would continue to heed warnings, including those likely to be issued later in the week. "We've been a bit fortunate as well that the ground conditions were a bit drier at the beginning of the event compared to last year," he said. "We're not out of the woods yet though there are still significant waters to flow through the rivers systems. "We have further rain forecast for this week and the bureau are concerned it could be 100mm – it all depends where it falls and the intensity." 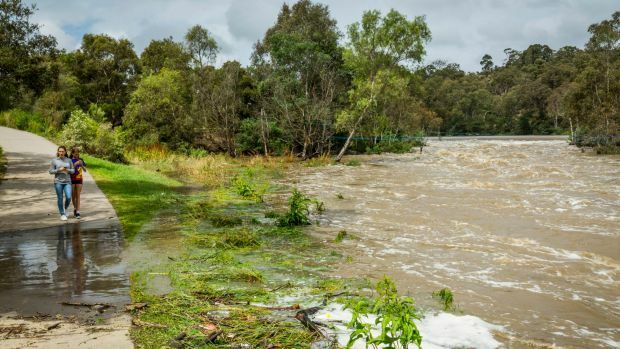 The respite from the storm meant relief for the parts of the state under threat from flooding, as water began to recede in the towns of Euroa, Myrtleford and the Buckland Valley that had been put on high alert. During the weekend, more than 2700 calls were made for assistance across Victoria and 73 homes affected by flooding. Some had water above floor level. The federal and state government announced that payments of up to $1890 per household would be available for those affected by the storm. Authorities said on Sunday the worst of the massive storm system was over, with the focus shifting to what impact the rain would have as it moves further downstream. Moderate flood warnings remained in place for the Seven and Castle creeks and the Yarra River, with kayakers making the most of the deluge as the water passed through Dights Falls near Abbotsford. All major roads had been opened by Sunday morning, with just a few minor thoroughfares closed by the downpour. A driver in Williamstown had to be rescued after he was swept off Racecourse Road due to a creek flooding the road, an MFB spokeswoman said. The man was uninjured during the 30-minute ordeal. Victorian Farmers Federation president David Jochinke said the impact on crops would be established the next few days. He said grain growers who worked hard to harvest before the storm came through would have been happy with their decision. "What we need is a lot of wind and dry conditions to prevent more damage occurring from disease," he said.